For its annual Mother’s Day brunch, the Men’s Club at our synagogue always serves a surprisingly lavish spread with the woiks–lox, bagels, fruit salad, eggs and mimosas. Although I’m not a huge fan of big and slightly-kitschy gatherings featuring big and slightly-kitschy piano acts, I really deserved someone else making me a lox-and-eggs Sunday brunch right about then. But at the last minute I had to miss it in order to hock my kid about her last oversized ridiculous semester projects for 8th grade (due the next day, naturally). Better mothers complained to the principal, who just smiled nicely but did nothing useful. I just figured we’d get through it all so my daughter never had to be an 8th grader again. It worked–salutatorian, even–so, moving on but not required to give a speech: win/win. But the lost lox! and the not having to cook or do dishes for Mother’s Day! Then I agreed to chaperone a school science camping trip the last week before graduation and ended up with sand, grime, KP duty, outdoor showers, iffy Boy Scout Camp-style food, and not just one but 32 whole teenagers preoccupied with their hair and late to class. So now that it’s all over I’m in serious need of payback. My local Armenian greengrocer has locally-smoked nova lox (they have sable, too–I was tempted) and I had a bowl of dough in the fridge just sitting there waiting to be used up–so I made a few impromptu bagels the last Sunday morning of the school year, as soon as I’d gotten all the sand back out of everything and my kid was done with classes for the year. The bagels weren’t quite as dense as they ought to be because I used my standard pizza/pita/calzone dough instead of the genuine classic, but they did well enough because the dough was several days old, cold-proofed and straight from the fridge, and I boiled them before baking. And there was lox. Throw in a few once-over-medium eggs and some shmear and some fruit and hot coffee and you’ve got the ideal late-spring/early-summer breakfast, even if you have to make it yourself. Now I know lox is a high-salt item–even the Nova. I anticipate it not for the salt, which I always think we could do with a little less of, but because it’s lox. A delicacy. Something to enjoy on the rare occasion when you get to celebrate. Something to treat with respect. I’m not going to apologize for enjoying it, either. In the modern world of food publishing, people are forgetting how to do that. Even Jews. Maybe especially Jews, some of whom act as though our traditional deli and “appetizing” (bagels, cream cheese and smoked fish of all kinds) is suddenly something to shove under a rug or apologize for liking on the grounds that it’s not organic or locally sourced or Whole Foods or food-mag-trendy enough, and because it doesn’t include bacon or pancetta. Or kale. The idea that enjoying lox simply because it’s lox isn’t cool enough anymore has gained a lot of traction in the past few years of foodieism. A couple of years ago, Martha Rose Shulman committed a serious travesty in the New York Times with “Lavash Pizza with Smoked Salmon” (she didn’t even call it lox). Toasted lavash is perfectly good for other things, but not for lox. Too fragile, and frankly too flavorless. I mean, why not rice cakes, as long as you’re being tasteless? But it wasn’t just the bread choice. Somehow Shulman had abandoned the Joy of Lox. Shulman actually called her lox on lavash “a great way to work more salmon, rich in omega-3 fats, into your diet.” I have to ask, are most of us really having that much trouble “working in” more salmon? More to the point, does any lox fanatic really want to be thinking about fatty acids of any kind while eating it? But at least she wasn’t agonizing over it as too Jewish. 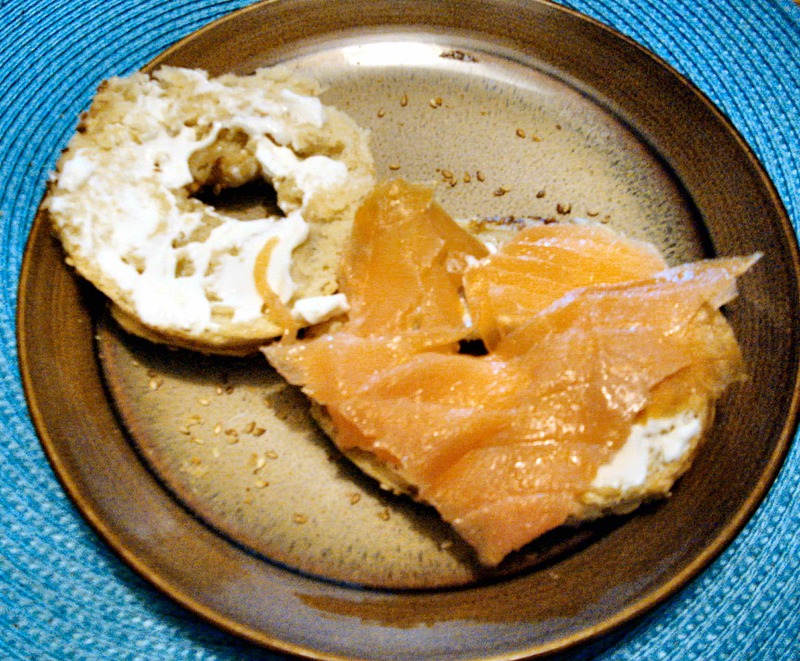 Mark Bittman pulled this inexplicable self-flagellation-in-print a few weeks ago in the New York Times, apologizing publicly for eating lox and bagels on a Sunday morning. In New York, yet. (Maybe it’s because he moved to Connecticut?) He’s kvetching about skipping his morning run, his usually-so-virtuous-but-betrayed-just-this-once-by-shameful-genetic-temptation stance on (gasp) farm-raised salmon, his devouring of shmear, which he says is too bland for the calories to like officially. He even had the nerve to blame his decision to eat it all on a sudden mental breakdown. And then he went further and called bagels and lox “comfort food.” As though it were in the same low-grade category as mac and cheese or mashed potatoes from a box. Vey ist mir! I mean, come on. I’m pretty sure Woody Allen still eats lox without apologizing for it. Bittman should be apologizing for being ashamed of enjoying lox (all the while glupping it). Along with apologizing for promoting pancetta and guanciale while professing a greener and more affordable diet. And for forgetting to add garlic to his recipes. That’s almost worse than deprecating lox. More recently, Melissa Clark met with one of the scions of Russ & Daughters, which by now you’d think was the only serious lox and whitefish emporium left–it’s the subject of a documentary I just missed at the last LA Jewish film festival. The two laid out a spread for at least thirty or forty very lucky people, by my standards, but I think they were doing it mostly for a few family and friends–maybe 10-15 people–and posing it all on the table for the camera. It was beautiful but way too much. At least, though, she was both thrilled and nostalgic, the right way to be when faced with a complete beauty pageant of smoked fish. Altogether, I could only think Shulman, Bittman and Clark all grew up in big cities with too much lox around. Because when I was a kid in the small-town South, we could only get lox twice a year when one or another set of grandparents came down from New York. Other people’s grandparents bring toys. Ours brought pastrami, corned beef, half-sour kosher dills, pickled green tomatoes, real bagels, serious breads you just couldn’t get down South, and lox. All of them were special, not just to us but to our grandparents–real deli was part nostalgia, part roots, part pride, part simply great eats. Pastrami and corned beef to go with the pickles and the tough, chewy pumpernickel and rye with the union label pasted on the end (you were supposed to fight for it)–these were the working people’s foods of their youth on the Lower East Side and the Bronx, and they still loved them. And so did we. My mother’s parents, born in the shtetls of Poland and Ukraine, came to America as children and, thank G-d [only instance of poverty being worthwhile], couldn’t afford to go back when their parents got homesick. Fast forward to the ’70s: My Grandma Thel, short, plump but ladylike, coiffed, and wearing those pale oxford pumps I used to think of as librarian shoes, would step off the little regional plane in Charlottesville loaded down with huge grocery bags full of chewy, crackle-crusted bagels, Jewish kornbroyt or “corn bread” (a heavy European wholegrain sourdough; no actual cornmeal except what’s dusted on the baking sheets to keep the loaves from sticking), rye bread laced with bitter caraway seeds, sometimes a babka, and always, a huge half-wheel of her own light chocolate-flecked sponge cake (for which I’ve inherited the recipe but haven’t tried it yet–will post when I get it right). I hope the other passengers were smart enough to be jealous. The aromas alone should have clued them in. Grandpa Abe, of vishniak fame, was a lucky man. You’ve probably already seen this–Mark Bittman is stepping out of his role as The Minimalist at the New York Times. I don’t agree with some of his recipes. Desserts with more butter than they really require to be good, expensive Italian hazerai (Yiddish for “that greasy pig stuff”) in a lot of the food, and too much reliance on salt as a flavoring, though he’s nowhere near restaurant-standard. To my mind, these could use a remake. I also don’t think Bittman always walks the walk when it comes to touting nonmeat meals and affordable, commonsense ingredients. But you can’t fault his enthusiasm and you definitely can’t fault his sense of fun on video. I don’t really think he’ll be able to parlay his next NY Times gig, on food politics and the like, into personal parodies of Blue Man Group, The Thin Man’s Return (He Couldn’t Resist the Spaghetti), or Legend of the [you-name-it Kung Fu] Master. But I could always be wrong. In the meantime, he’s given us more loose-jointed “101 variations” kinds of roundups for summer salads, Thanksgiving side dishes, etc. than almost anyone else and has written two gigantic tomes on How to Cook Everything –even though I’m not sure I’d really want to cook everything. I mean, everything? Too many dishes to wash. Makes me tired just thinking about it. I’m not a big fan of cooking meat–never really had a great knack for it, and the lack of easy access to kosher butchers and fresh, unfrozen meat for most of my working life has made it easier to move to dairy, vegetarian, and fish dishes as my mainstays. Out here in Pasadena, my Trader Joe’s carries reasonably priced kosher chicken, turkey, and occasionally beef. But in recent years, the Post, Iowa slaughterhouses that supplied the west coast kosher markets were treating both their cattle and their workers so badly before they were shut down that I just stopped buying meat altogether for a while. In the past two months, though, I’ve tried to get back to cooking chicken once in a while–Trader Joe’s started carrying Empire poultry again, and my daughter and husband have been clamoring for it. But once you lose the habit of cooking meat, it’s hard to go back. For one thing, chicken and turkey are so dense compared with fish and dairy. Doesn’t really matter how many or how few pieces you have, it still takes the better part of an hour to cook all the way through–something I’d forgotten about. Even microwaving doesn’t seem to help much. 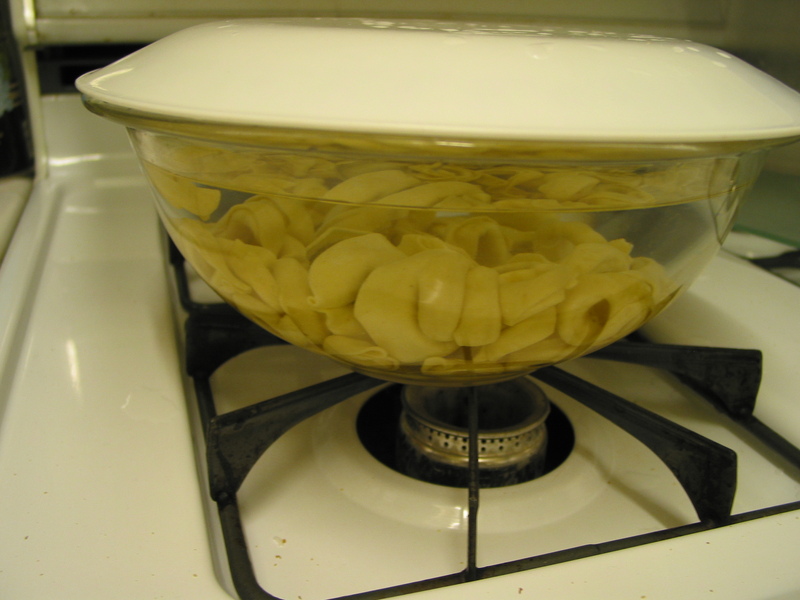 Contrast that with a fish fillet or steak in 15 minutes or less, an omelet in 5 minutes, filled pasta in 10. No wonder I don’t gravitate towards chicken now that I have a kid. I knew from sore experience that it would take more than a day in the fridge to thaw properly, so this time I started 2 days ahead, and it seemed to go better from there. I also figured out enough time–at least 2 hours just in case, on a day when I wouldn’t end up frustrated and furious. But turkey–I’ve never eaten turkey that was actively good. Well, not the white meat, anyway. Ta’am (“taste” in Yiddish and Hebrew), my grandmother’s first criterion for whether food was worth eating, is something I never really associated with turkey breast, and probably for good reason. A duty rather than a pleasure, and I always think it would have been better if it were chicken. What to do?